Boxer, a part of Winn, Mich.-based manufacturer Morbark, has expanded its product offerings beyond its line of compact utility loaders with its new Boxer X7 Brush Chipper. Designed primarily for the rental market, as well as small independent contractors, the 7-inch capacity Boxer X7 is engineered to be easy to use, easy to tow and easy to maintain, the company said. 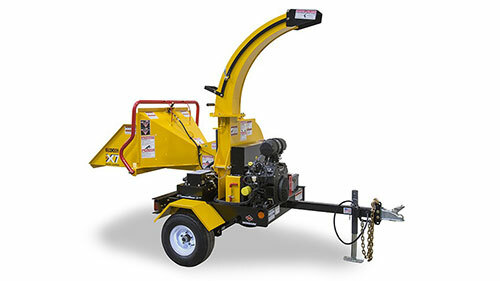 The machine features a 32-inch diameter, 1.25-inch thick chipper disk and a reverse pivot in-feed with internal drive, which applies 1,118 lbs. of clamp load to the material, according to the company. The 24-cubic-inch-displacement (CID) feed wheel motor provides more than 1,700 pound-foot of pulling force. A Kohler 25-hp EFI gasoline engine powers the X7. The in-feed design also eliminates springs and bearings, in an effort to reduce maintenance and service points. With limited moving parts, bearings and hoses, the X7 chipper is designed to make maintenance simple, for faster turnaround times and greater productivity. Other maintenance-friendly features include the hinged chipper hood, for convenient access to the chipping disc, and the in-tank hydraulic filter design with breather and oil indicator level to reduce leak points associated with remote mounted filters.